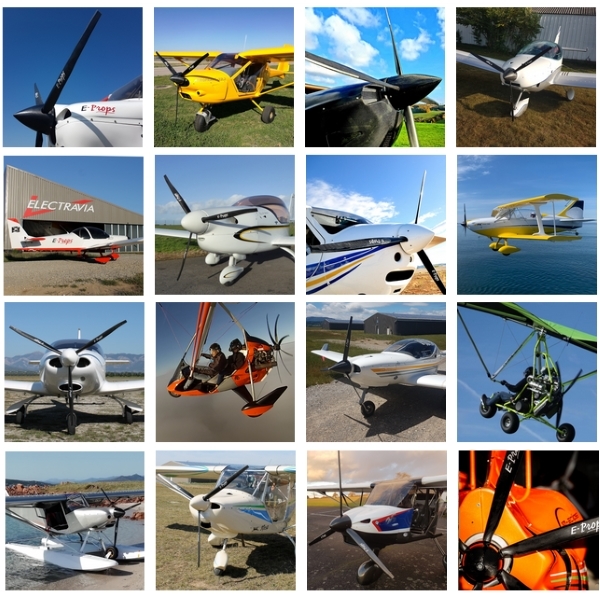 The E-PROPS company designs, tests, manufactures and sells hi-tech carbon propellers for leisure aviation (airplanes, LSA, ultralights, delta trikes, gyros, drones, paramotors, paratrikes). - Innovative and efficient propellers models with fixed or adjustable pitch : the E-PROPS are the world's lightest propellers. The ELECTRAVIA - E-PROPS company is also known for its electric motorizations systems developed for leisure aviation (engines, controllers, dedicated instruments, batteries BMS, dedicated propellers), as well as for aircraft equipped with these new successful and silent propulsion systems made between 2008 and 2014. At present, the company has temporarily suspended its works on electric systems, while waiting for batteries allowing a bigger range. The team dedicates itself to design and manufacturing of the E-PROPS propellers, which meet a big technical and commercial success. - October 2006 : beginning of the ELECTRAVIA project. - December 2007 : Electra, the first 100 % electric aircraft in the world, makes a 48 mn first flight pilot Christian Vandamme. A immediate international recognition ! - August 2009 : wooden propellers Hélices E-PROPS on the market. - September 2010 : world speed record [262 km/h] with electric MC15E Cri-Cri (Pilot Hugues Duval) with electric E-MOTOR engines and contrarotative E-PROPS propellers. - November 2010 : new premises with photovoltaic roof, energy-plus buidlings, on an airfield in Provence : Sisteron - Vaumeilh (LNFS). - March 2011 : first flights electric paratrike Kermelec with very quiet E-PROPS propeller. - May 2011 : E-Fenix, first 2-seater paratrike in the world with QD2 E-PROPS propeller. - June 2011 : new world speed record [283 km/h] with electric MC15E Cri-Cri during the 2011 Paris Air Show. - August 2011 : flight tests of the MC30E Firefly with E-PROPS with special designs. - December 2011 : first flights of electric motorglider ElectroLight 2, demonstrator of ELECTRAVIA's innovations with very quiet E-PROPS propeller. Design in digital wind tunnel, optimization with the LmPTR software, elaboration of manufacturing's processes, tests (numerous!) and materials choices, implementation of tools and equipments, brought out of the first models, ground tests then in flight tests : ELECTRAVIA carbon propellers have required 3 years of relentless works, 7 days a week, to succeed in finalizing them. Many tests, some failures, some successes, then still tests, compelling periods followed by discouragement's moments, to obtain at the end an efficient manufacturing"s process and very light and efficient carbon propellers. The propellers of 3rd generation ! - June 2012 : first flights and presentation in a big airshow (Mondial de Paramoteurs de Basse-Ham 2012) of the 1rst electric powered 2-seaters paraglider, the E-SPIDER, with QD2 E-PROPS propeller. - September 2012 : new propeller ground ajustable 4-blades in carbon EXCALIBUR for ROTAX engines family 912. - June 2013 : first PLUG'n'FLY propellers, specific for PPG. - October 2013 : 20 models allow to answer to a lot of needs. The E-Props propellers are now marketed in 30 countries. - January 2014 : between July 2013 et January 2014, a first fatigue tests campaign has validated a MTBO for the carbon E-Props propeller of 2.000 Hours. - March 2014 : the Electravia team has decided to suspend its activities of development, integration and marketing of electric motorizations for aircraft, in order to dedicate itself completely to the manufacturing of its carbon E-Props propellers. Electravia is waiting for better batteries, to increase the flight time and reduce the charge time. - October 2014 : a new worskop is built, and now the company has a total of 1.700 m², dedicated to propellers manufacturing. - March 2015 : the E-Props propellers have a great success all over the world (more than 50 countries). Those propellers are the lightest on the market. - Sept 2015 : the team is composed of 12 people. - March 2016 : E-Props presents its new propeller, EXCALIBUR-6 (6-blades), with a special H²D concept. It is designed on about the same principle as some anti-torque tail rotors of helicopters, to significantly reduce vibrations and noise. This propeller has a thrust of 350 kg (on a 150 hp engine). An immediate great success ! - June 2016 : E-Props has now 19 people for the design, manufacturing and marketing of the propellers. The annual production's capacité is 7.500 carbon blades in 1.700 m² workshops. The E-Props propellers are sold in 56 different countries. 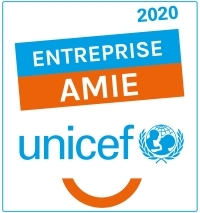 A great success due to a lot of work and passion ! - October 2016 : Pascal joins the team as sales manager for paramotors propellers. 20 people are now working for E-Props. The company ensures the production monitoring by RFID and KANBAN method. Beginning of the works to realize new workshops, in order to multiply by 4 the yearly production (target at the end of 2017 : 30.000 blades / year). - May 2017 : beginning of the building of new workshops (curing and injection). The production capacity is growing from 12.500 to 18.500 blades/year, always increasing up to the goal of 30.000 blades/year at the end of the year 2017. Production of some models is suspended to produce more of the common models. - a machining centre custom designed and built to allow the dimensional analysis, the rectification and the finish of the carbon parts automatically, without dismantling of the part. It is equipped with a directional brooch on 5-axis programmed according to the digital definition of the part, with a wide tool store. The precision of measure by the scanner laser is of 5/100th of millimeter. - a professional 3D printer, in order to realize equipments, molds, prototypes and of pre-series parts, as well as lighter functional components. - December 2017 : the production capacity is now 22.500 blades/year, increasing to the target of 30.000 blades/year. E-Props propellers are now sold in 70 countries and equipped more than 200 different models of ultralights / LSA and 350 paramotors brands. The company counts from now on 23 employees. - February 2018 : release of the new range of PLUG'n'FLY propellers with SCIMITAR design : even lighter (less than 410 gr for the lightest), more thrust and less noise. - March 2018 : on-line release of the new shop : www.shop.e-props.fr. Thousands of carbon propellers for all engines and reducers, in 12 different diameters, discounts and shipping costs offered all over the world ! - April 2018 : the new workshops, tools, molds and equipments allow now to produce 30.000 blades / year. An exceptional industrial capacité in the leisure aviation's field. - July 2018 : to further its development, ELECTRAVIA recruits. The company increases its staff to 25 employees (including 6 at design department). - September 2018 : the ELECTRAVIA - HELICES E-PROPS company is celebrating its 10th years ! - March 2019 : 28 people are working at E-PROPS. The company is following its development in several countries (more than 80) and is working on many projects with major companies and research laboratories. ... and the story goes on ! The E-PROPS company is also working for major companies, on different projects requiring expertise in propellers. Those projects are submitted to Non Disclosure Agreements, and thus cannot be detailled here.